Great for benchmarking graphics cards. GameSpy services were shut down on May 31, 2014. Maximum Edition. Included with Origin Access Basic. 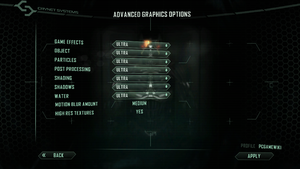 The original edition of Crysis 2 on Steam carries TAGES Solidshield DRM with a 5 machine limit, while the Maximum Edition contains Steam's "stub" form of DRM in addition to SolidShield, although the SolidShield wrapping seems inert. Write g_skipIntro = 1 at the end of the file. Open game.cfg with Notepad (or create if it doesn't exist). Add g_enableInitialLoginScreen = 0 to the file. Crysis 2 auto-detects your Operating System's language and uses it without asking. 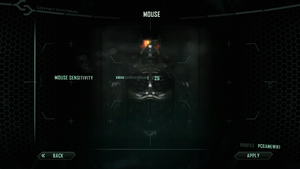 Patch 1.9 prepares Crysis 2 for DX11 features and high-resolution textures. Each need to be downloaded and installed separately from the 1.9 patch. They are both included in the Maximum Edition. The DirectX 11 Ultra Upgrade can be downloaded here. The High-Res Texture Pack can be downloaded here. The High-Resolution Texture Pack doubles the fidelity of many of the game's art assets. 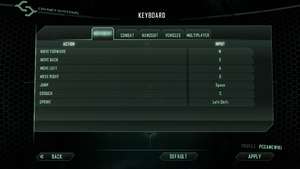 Crysis 2 is very memory intensive. This app improves performance for Crysis 2 on 64-bit Windows systems with more than 2GB RAM by allowing it to access up to 4GB RAM. For those who truly want to push Crysis 2's graphical fidelity to its limits, BlackFire's Mod 2 and MaLDo HD serves their needs. A step by step list of instructions is available at this forum post over at Crydev.net . Every automatic checkpoint save made in the game is saved as a permanent save file. There is no way to delete these files in-game, nor are they ever overwritten on subsequent playthroughs. These files can add up to several hundred megabytes worth of permanent save files if playing through the single-player campaign more than once. Default is 55° vertical. See Field of view (FOV). cl_FOV controls the main game world FOV; r_DrawNearFOV controls the FOV for nearby objects, primarily your arms and weapon; and pl_movement.power_sprint_targetFOV controls the FOV used only when you sprint. 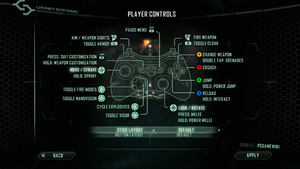 In-game gamepad layout settings for the player. 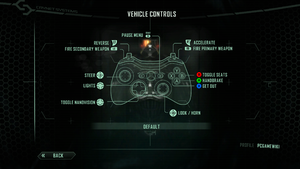 In-game gamepad layout settings for vehicles. 16 Online server browser stopped working on May 31, 2014. Use the Crysis 2 Community Dedicated Server Package. 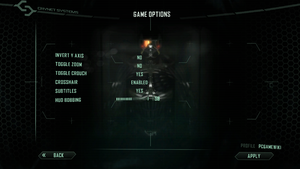 See Helix Mod: Crysis 2 for better 3D support. The statistic-screen in the menu displays that 13 weapon-attachments are findable in single-player but in fact there are only 12. Therefore, it is not possible to achieve "100%". Make sure your display is capable of scaling the game resolution to its native resolution, if you like to game at weird resolutions. 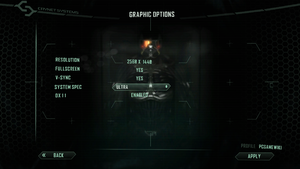 GPU scaling is very useful but under Crysis 2, it introduces an extreme form of lag. Now, play Crysis 2 and see if you notice the difference. (ALTERNATE SOLUTION) This game does not appear to like the Xbox One Controller and will cause severe lag on launch. If you happen to have one plugged in, disconnect it. This fix probably works with previous versions of Lucid's software. The game may set your monitor's refresh rate to 24 Hz; this results in stuttering and poor performance even if internal GPU render shows a high FPS. If your monitor has a manual frame rate select button, toggle it to reach your desired refresh rate. Otherwise, set the game to window mode, then set it back to fullscreen mode. If you use an external TV as a monitor to player Crysis 2 you may encounter a bug where the game always uses a 24Hz mode on the TV, resulting in a laggy frame rate. Sadly there is no official fix for this issue. One temporary solution for this issue is to use ForceFix. 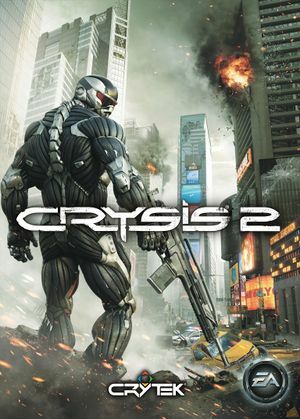 Originally used for Metal Gear Rising, which as of now is also experiencing the same issue, also works for Crysis 2 as well. Another way to play the game in fullscreen is to force borderless fullscreen windowed mode. The display should switch to 1920x1080@60Hz. Create DWORD entry "ForceRefreshRate" and change its DECIMAL value to the refresh rate of your monitor. 64-bit users will need to do this at HKEY_LOCAL_MACHINE\SOFTWARE\Wow6432Node\Microsoft\DirectDraw as well. This will force DirectX games to run in your monitor's refresh rate. You can change your refresh rate manually each time you open and close the game. The game will close shortly after starting, and Windows Defender / Microsoft Security Essentials will report to have blocked activity of "VirTool:Win32/CeeInject.gen!FG" malware. However, this is a false positive. 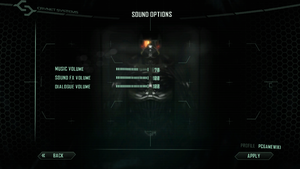 Add the Crysis 2 folder to the exclusion list. ↑ 1.0 1.1 File/folder structure within this directory reflects the path(s) listed for Windows and/or Steam game data (use Wine regedit to access Windows registry paths). Games with Steam Cloud support may store data in ~/.steam/steam/userdata/<user-id>/108800/ in addition to or instead of this directory. The app ID (108800) may differ in some cases. Treat backslashes as forward slashes. See the glossary page for details. This page was last edited on 8 April 2019, at 09:45.